We have written this book with the aim of alleviating the distress and discomfort experienced by patients with Parkinson’s disease during the ‘coming-on’ and ‘wearing- off’ of L-dopa medication. With many years experience of close monitoring, assessment and regulation of responses to anaesthetic, pain control and other drugs, monitoring of L-dopa has been an inevitable consequence. 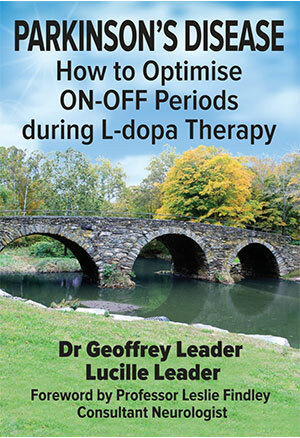 During our many years of ‘micro-monitoring’ and constant re-evaluation of timing of L-dopa administration, dosage and drug response, we have been able, to a large extent, to ‘smooth out’ this upsetting ‘On-Off period’. In order to do this, we developed a set of observational programs for the patient to complete at home. The results have then enabled us to suggest a dosage and time of administration, in collaboration with the patients’ team, which to a large extent has alleviated the distress of symptoms during the ‘On-Off’ period. Our experience of ‘micro-monitoring’ has clearly demonstrated that each person will have a different response to L-dopa. The time of onset and length of efficacy of various doses will vary from person to person. Dosage will be titrated (adjusted) to the individual’s optimum response, in order to minimize any dopa, or dopa combination-induced dyskinesia. This will prevent ‘under’ as well as ‘over’ dosage, whilst aiming to establish an ‘on-going’ level of L-dopa so as to prevent significant ‘dips’ in the effective blood level. It is essential for the monitoring programmes to be used in a stress-free environment (any stressor will affect the response of the drug trialed). There are also prerequisites for general and intestinal health, drug and nutrient interactions which affect drug response. These are taken into account and presented in this book. The goal of therapy is to maintain comfortable movement, as much as possible, within the confines of Parkinson’s disease.